Designer, photographer, blogger, husband. USofA, France. Currently accepting projects. 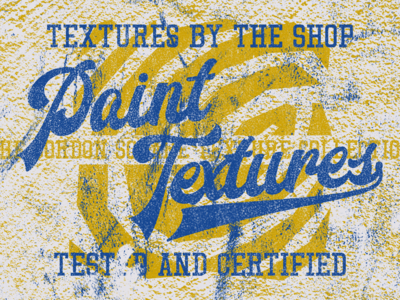 A little something I got ready for Monday morning — Now that I've finally released the ginormous Gordon Square Texture Collection, I'm ready to move on to other design assets. I'll share more about this little guy on Monday morning. 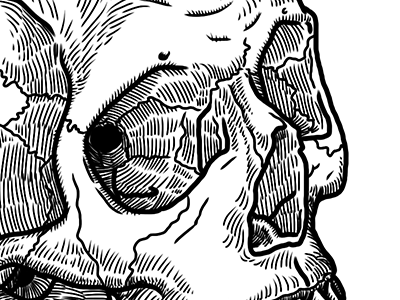 Human skull — I'm happy with this one. 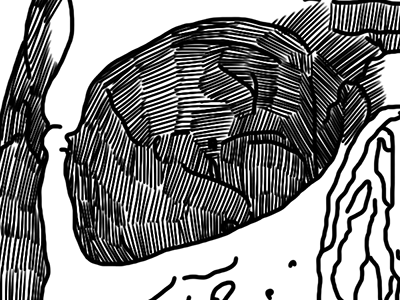 I managed a shading approach that isn't "cross hatch all the things! 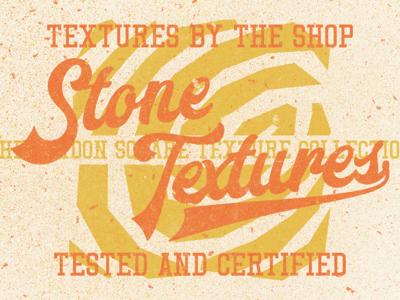 ", to leave open areas for the shapes to breathe, and to be more readable. The goal for the next pieces is to make the direction of the shading more in line with the volumes of the piece. 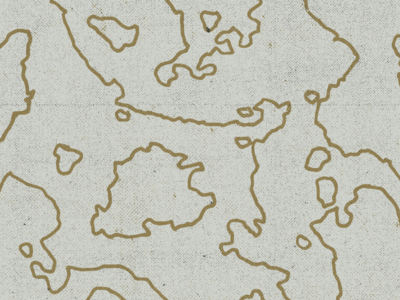 I feel like there are still areas that feel a bit flat. 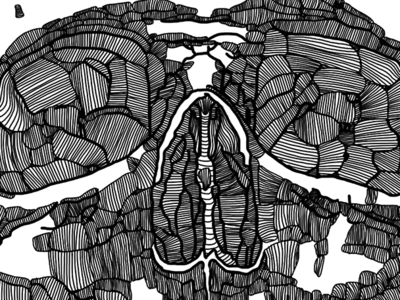 Unfinished skull — This old piece ended up unfinished. I hit a block in the road, and grew very unhappy with my shading technique. I might have to revisit my line work, and apply some other approach to it. 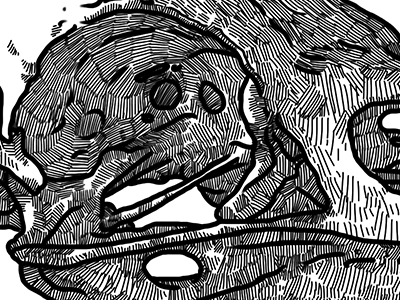 The volume/light rendition right around the area where the eye socket meets the nose opening is satisfying, but overall the image is too dark. Apparel design illustration explorations — These two illustrations, which ended up not being used, were done as explorations for an apparel design project for one of my favorite restaurants in Cleveland: Toast. Each were drawn using stock imagery as a reference. The first piece wasn't even shaded, just line work. The second one features a second color as shading. You can have a closer look at each piece in the attachments. 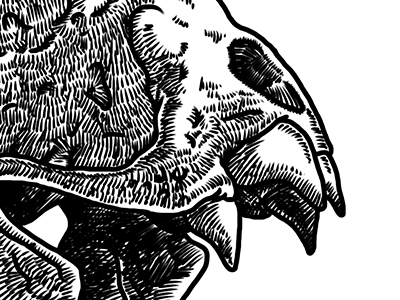 Corvus Corax skull — A long time ago, I drew another common raven skull. I decided to revisit with a different reference, and an update to my shading technique. "The common raven (Corvus corax), also known as the northern raven, is a large all-black passerine bird. Found across the Northern Hemisphere, it is the most widely distributed of all corvids." Is this thing on? 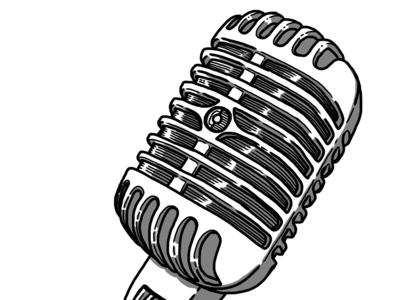 — Hello there, is this thing on? It's time to dust the good old Dribbble profile off. 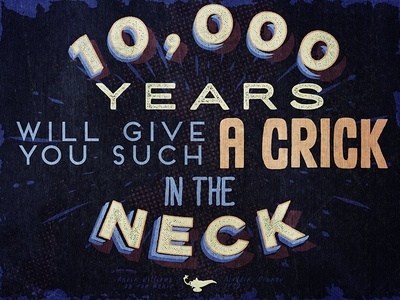 "10,000 years will give you such a crick in the neck!" — An entry for @Rogie 👑 's quote contest. I miss Robbin Williams a lot. 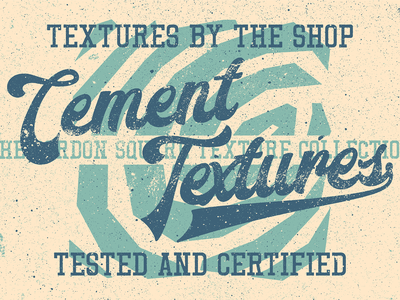 (A closer look at the clean and textured versions is available in the attachments. 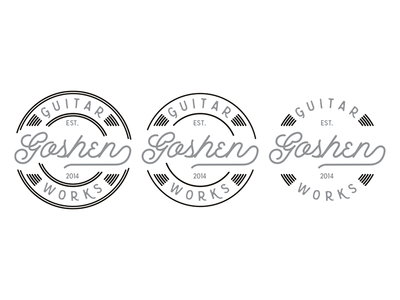 Goshen Guitar Works, phase three: final assets — After all this variation work, we settled on a list of final assets to use: - The main mark, in its main color scheme, then in black and white - The secondary mark, in black and white. 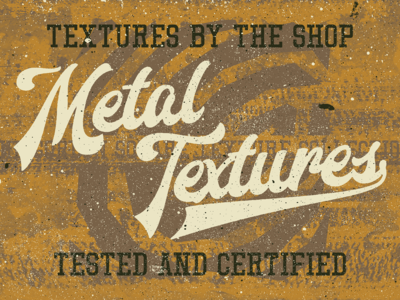 - The alternative color schemes we couldn't bring ourselves to leave out on the cutting floor You can have a closer look to all of these in the attachments. Goshen Guitar Works, phase three: fine tuning, secondary mark — After the main mark got finalized in the previous step, we decided to see if simplifying things further for the secondary mark could be of interest. We decided to stick with the full version. 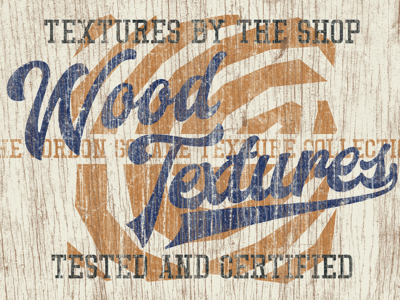 Goshen Guitar Works, phase two: more stuff — To anchor the project some more within the guitar world, I hunted down the official colors from the big two guitar manufacturers out there (Fender, and Gibson), and went to work on creating combinations. Additionally, I also created a smaller footprint version for square application, and looked at various ways to apply color to it. Goshen Guitar Works, phase one: sketches. 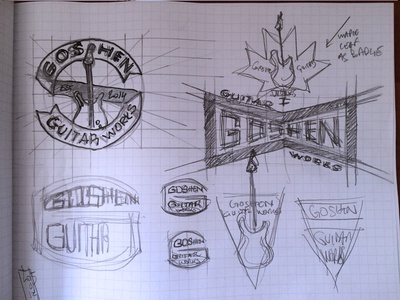 — Here are some of the sketches done while working on the mark for Goshen Guitar Works. The attachment shows the pages in order, from not so great warm-up, to more structured ideas.